Well, we are off again. Maps studied, route picked (with a little help from Algonquin Outfitters, and our friend Gord Baker). Gord was a guide in Quetico Provincial Park for a few summers and knew the lay of the land like the back of his hand. Corny huh, but he was filled with so many good ideas and options. All is packed, Kicking Frog washed, and waxed twice. It helps movement through the water, and I always do this for our trips. Try it once and you will do again and again. Up early, our customary bagels and coffee and we head north. Another adventure to share. As we drive we talk about the year that has just finished, working with students at our respective schools. The joy we have sharing our knowledge with our students and the students sharing their knowledge with us. The excitement of learning, laughing, giggling, and sharing some sadness with these students has made for another exciting year. Our thoughts begin to focus on our plan and what we are about to do. Up to Wawa, stay at the Mystic Motel, say hi to the owners, now friends because of all of the times we have stayed there. Call to see if David Wells, down at Naturally Superior Adventures, is there. David has said we are his second oldest clients-we met him the first year he opened his company. He is busy on a trip with clients so we head over to Kinniwabi Pines Restaurant. The family that owns the restaurant also have become great friends. Great food, drink, and conversation is had by all. Another couple we have had the pleasure of meeting is Joel and Carol. We had met Joel the year before on one of our Pukaskwa National Park trips. He works with the MNR in Wawa and Carol is the Chief Naturalist for Lake Superior Provincial Park. We met Joel on the shore of the Dog River and the Lake after Kathleen and I had just finished our hike up to Dennison Falls (a must for any canoeist or outdoor enthusiast, absolute power and beauty). We talked more about our homes etc, Joel shared with us where we could see bald eagles and their nest as we travelled along shore. Yes "their", because a mother and her two little ones were nesting. We could see their little heads bobbing as we paddled by. We finished our trip a few days later, went back to the Mystic, got all cleaned up, and decided to go to the Kinniwabi Pines Restaurant for a wonder dinner (two weeks of dehydrated foods and we are ready for some "real" chow) and another great evening with Kathleen. Just before we started our meal Joel walked in and said he had a surprise for me. He went back outside and brought in his wife Carol. He introduced her to Kathleen and me. How nice, but the surprise was that Carol had babysat my two children back in Mississauga years and years before. A small world HUH. But please note that I had both of my children by the time I was 14 ( ha, ha). I felt older but delighted to spend time reminiscing about the babysitting days in Mississauga. We called Joel and Carol to say hello and they invited us over to their home for a visit and a BBQ. They live on the lake in the beautiful Michipicoten Harbour. One of those magical evenings, great friends, great conversation, great company, great food and drink. Bonus was the black sky full of stars, a full moon, and Mars. Hmmm not bad! From Wawa to Thunder Bay, well, actually from Sault Saint Marie to Thunder Bay is considered by me the Rocky Mountains of Ontario. The sheer beauty and ruggedness of the Lake Superior shoreline and the sea is a must for all to see. What is Quetico going to be really like? 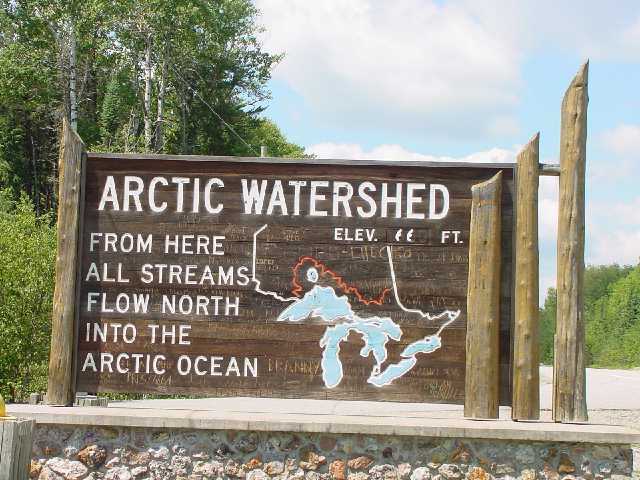 We dream of the water, rock, trees, fish, wildlife, campsites, fires, food prep, weather, portages and oh yeh, about all of the bears that are seen in the park. We have researched and talked to many people who have had the pleasure of experiencing the presence of bears and their cubs in Quetico. We also realize if our campsite is clean and free of food and its smells, we will be OK. This brings me to the fun I have hanging our foodbag. It perhaps, at times, takes me hours to just get it hung right. You know, the right branch, just the right amount of distance from the tree. Ten feet up and 4 feet away from the trunk of the tree. No branches that the little bears can climb out onto, and, swat at, and perhaps knock down the food pack. Could prove to be trip-ending if it happens. The 10 X 4 just does not cut it for me. There are so many others ways to hang your food. I remember one time I had an 80 foot rope which I threw up, the rock went over the perfect branch and all of a sudden all of the rope continued to go up towards the branch. Being slightly higher than the 10 feet mentioned, this particular branch was, well perhaps, well almost 40 feet high. Thank goodness the rock was tied properly and was just heavy enough to bring the rope down to the ground where I could pull the rest back down. And of course you have to do it again. Well, one maybe just a little lower, but not much! Oh I forgot to mention that the whole time I am plotting and planning and hanging the rope, my little one is giggling to herself, and enjoying watching me, as I try again and again for just that perfect branch. Oh there are so many more rope throwing stories we will share in future. Some excellent "how to" and many "how not to" ways to properly hang your food pack. Just before Thunder Bay and just off of the highway we see a sign for the Terry Fox Memorial. One of Canada's true heroes. Terry was trying to run across Canada to raise money for cancer research. Terry had lost a leg to cancer. With a prosthesis leg and his own leg (if you can imagine) he began his quest in Saint John's, Newfoundland. He ran through rain, snow, cold and hot weather and reached this spot. He had to stop because his cancer had returned. He passed away a short time later, but because of his effort, his legacy has lived on, and is celebrated each year with the Terry Fox Run for Cancer. The little one and I celebrate ourselves. We spent time at his monument trying to understand a little of what sacrifice he made. WOW! We stop for a quick overnight stay. Have to do laundry you know, things do get dirty. Not smelly, but dirty. Meet a great guy in an Italian bakery. Try some of his special cheese, and it made me pucker. Next stop was the water shed location. 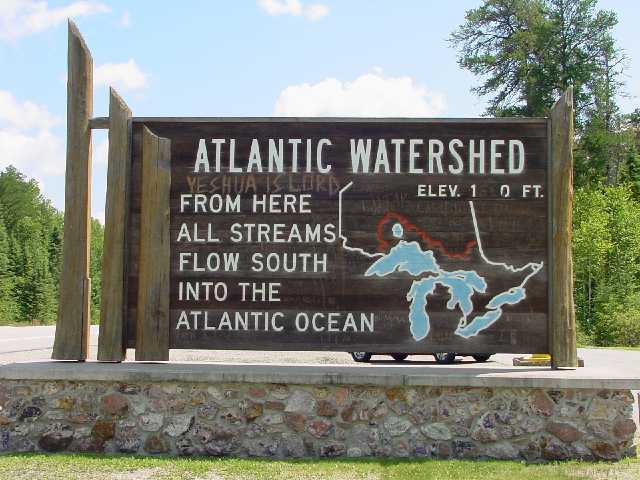 From this point all waters travel to the Arctic Ocean and all waters flow to the Atlantic Ocean. Yeh I know, there was not a hill there to verify the waters going both ways. We just have to believe it. And I do. 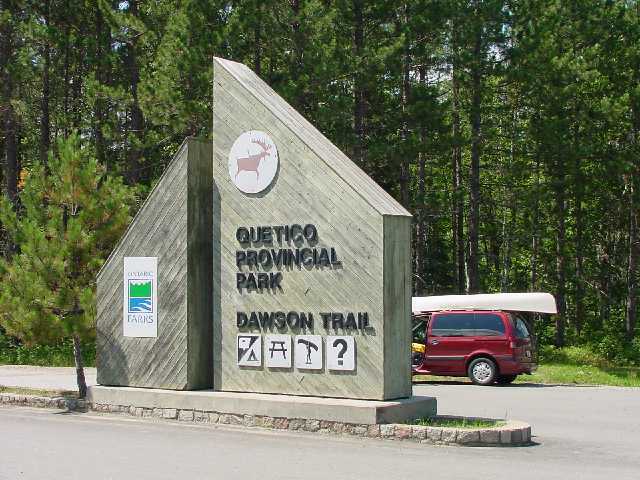 And then we arrive at Quetico Provincial Parks Dawson Trail Campground. We have reserved a sight for an overnight stay. We are meeting friends from Rochester, NY. They are going to join us on the next adventure. The staff at the Park Office are very helpful. We had pre-registered our trip starting at Nym Lake access point. The staff get all of the paperwork completed and they give us the history of the area and the park. Our adventure to Quetico has begun.